tilt the slice squeezer to pour the desired quantity of lemon juice through the small hole designed for that purpose, and raise it to stop. Dose as you wish! if you wish to pronounce Sjus properly, imagine a Sioux Indian, and simply add the S sound at the end ! Indeed, you can live without the Sjus slice squeezer. People who enjoy seafood, fish, carpaccios and other dishes that come with lemon will however have noticed the inconvenience resulting from pressing a slice of lemon, often placed in the dish with the best intentions: decorate and provide a reasonable amount of lemon to accompany the dish. Reality differs from the intention: decoration wise, it works. Dressing wise, it's another story: the most polite will discretely try and press the slice with their fork, but will be inexorably disconcerted by the inefficiency of their attempt to extract the juice. The boldest will use their hands and see the precious lemon drops sprayed everywhere except in their plates, will bite the bullet when one drop lands on their sore scratched fingers, and in the worst case, will attract the wrath of their neighbours at the table for having scattered their clothes or faces with nectar a little to acid to their liking. This is when the Danish inventor strikes and develops the SJUS (Squeeze Juice Unique System), simple and inexpensive device to give back to lemon fans the desire to season their dishes without taking inconsiderate risks with their wounds or their entourage. 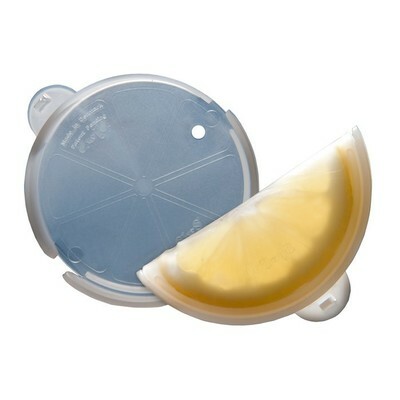 functionality - an original concept that at last allows you to use lemon slices efficiently without making a mess.